With the holidays coming up, I’m always on the lookout for creative and unique gifts for my children. I want my children to explore and use their imagination while they play. In a world inundated with electronics, flashing lights, and instant gratification, these types of gifts are harder and harder to find. I was so happy when I was introduced to Hape Toys. Hape specializes in toys that encourage children to explore and use their imagination, while they are playing and learning. 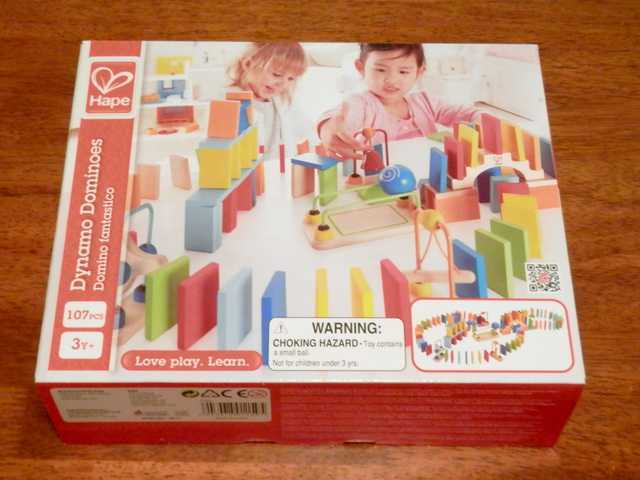 Hape is committed to quality and each set of toys is specially crafted using natural materials and water-based paints. 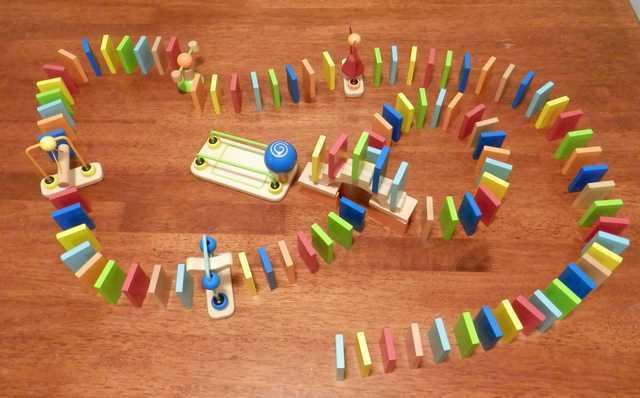 The first toy that we were able to play with was the Dynamo Dominoes. The Dynamo Dominoes set comes with 100 multicolored dominoes. Each domino is made of solid wood. 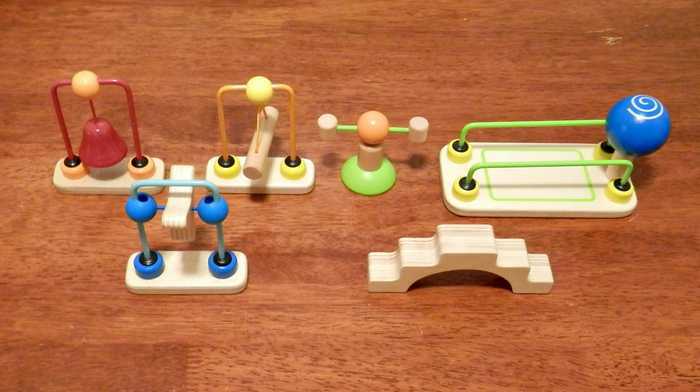 The set also comes with a ball, steps, a bell and other fun tricks that add a new level of fun to a traditional toy. I was impressed with how well each item was made. These are solid toys and will last for a long time! The dominoes are the perfect size to be manipulated by little hands. Children can mix and match different tricks with different patterns of dominoes to make new domino runs, each time they play. But this toy isn’t limited to domino runs. Dominoes are great for stacking and building. There are so many ways to play with the steps, the bell, the ramp etc. My husband and I even had fun setting up the dominoes and having races. Because it is made from wood and water-based paint, I don’t have to worry about toxic chemicals. Let your children learn and play, with their imagination and ingenuity leading the way! 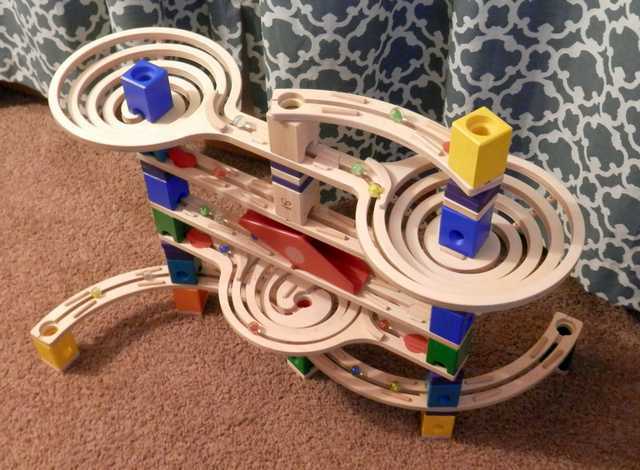 The next toy that I want to introduce you to is the Loop de Loop Quadrilla marble run. The Loop de Loop combines hair-pin turns, screaming fast accelerators, twirling funnels, and a see-saw into a fast-paced marble show. 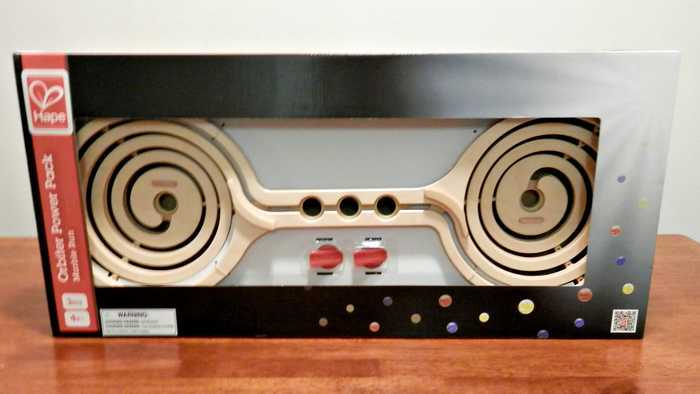 Each block and track piece is wooden and specially crafted to keep the marbles rolling at top speed. 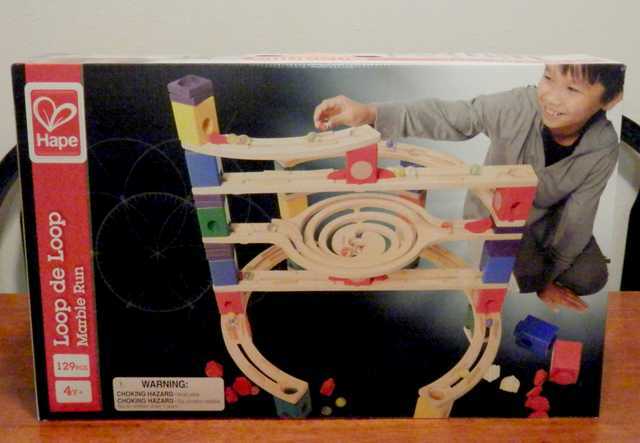 Hape recommends this marble run for ages 4+, but I think 6 years old would probably be more suitable. There is a level of engineering and planning involved, that would probably be advanced to most four year olds. There is a step-by-step instruction guide that is very handy, as you are beginning to design tracks. The instruction guide has instructions for four separate track combinations. Once you are familiar with each piece, it is very fun to try and design your own tracks. The Loop de Loop is very well made and each piece fits together seamlessly. Because of the interlocking blocks, the structure is very solid and is not easily knocked over. 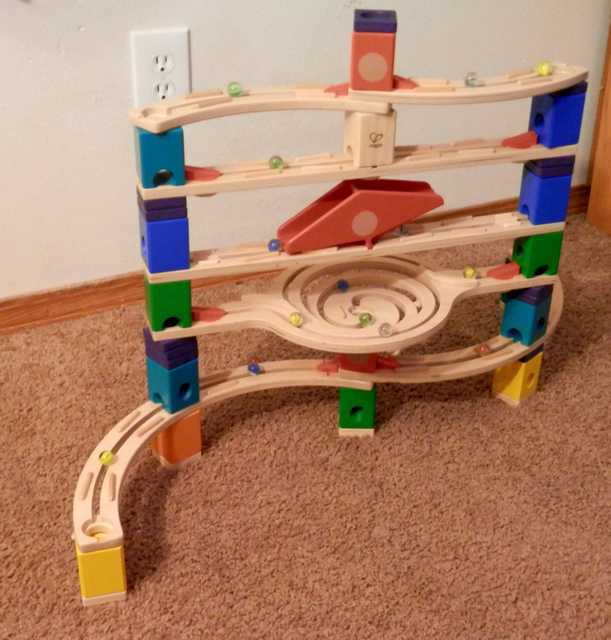 There are many accessories to add new levels of fun and creativity to your marble run. One of those is the Orbiter Power Pack, which features a dual funnel and two accelerators. The Orbiter is easily incorporated into the Loop de Loop, for a multiplicity of dizzying twists and turns. I love how sturdy, well-made, and fun the Loop de Loop Quadrilla marble run and the Orbiter Power Pack were. When beginning your holiday shopping this year, don’t settle for the same loud, plastic toys. Get your children or grandchildren a toy that is fun, challenging, and full of creativity. Hape products are well made, durable, and eco-responsible. They would be an excellent gift this holiday season. I received products in order to facilitate a review. All opinions are my own. I was not required to give a positive review. we had games like this when we were younger. they were fun! I love hape toys. These products look so durable! My grandsons would love the Loop de Loop! The first thing I love about these is they don’t take batteries, so sick of buying batteries! I also love that they get to use their imagination and have fun. What a great educational toy with great colors and this would be great for my nephew. He would love to spend hours playing with this set! 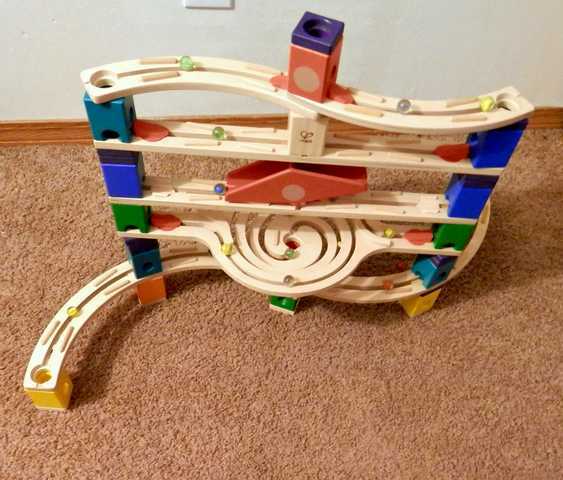 My kids love Hape toys and I hope to add this marble run to their toys when they get a little older. I find the website hard to maneuver. And no costs to the toys. I’d love to see the marble maze and its cost, but can’t seem to figure it out. ?? Hi Carol! Any suggestions to improve the website would be fantastic. We are always looking for ways to improve for our readers. Hape did not give me an MSRP to publish. I have seen several different prices for the Loop de Loop, at different retailers. The price seems to depend on the retailer you wish to purchase from. Thanks again for your comment. These look like fun and good sturdy toys. My grandson loves to build. These toys look like a lot of fun. I think even my 6 year old would enjoy them! Such sturdy fun toys. Exactly the kids I’m looking for. We had something similar to the loop de loop in the church nursery, and that has always been a favorite toy of every child that came through there. I think more toys should be based on imagination and curiosity…. isn’t that what playing is about?